Yesterday I took a trip down to the coast of northern Kent to visit Margate. The town is on the cusp of a remarkable regeneration. There is a great deal of wonderful heritage both clearly extant and being gradually re-discovered. A new art gallery, Turner Contemporary, bears the name of one sometime resident and frequent visitor, JMW Turner. This and the recently introduced HighSpeed rail link to St Pancras International offer the possibility of fresh prospects. This may well have been the same sort of Margate that the convalescent TS Eliot and his first wife Vivienne visited in 1921. 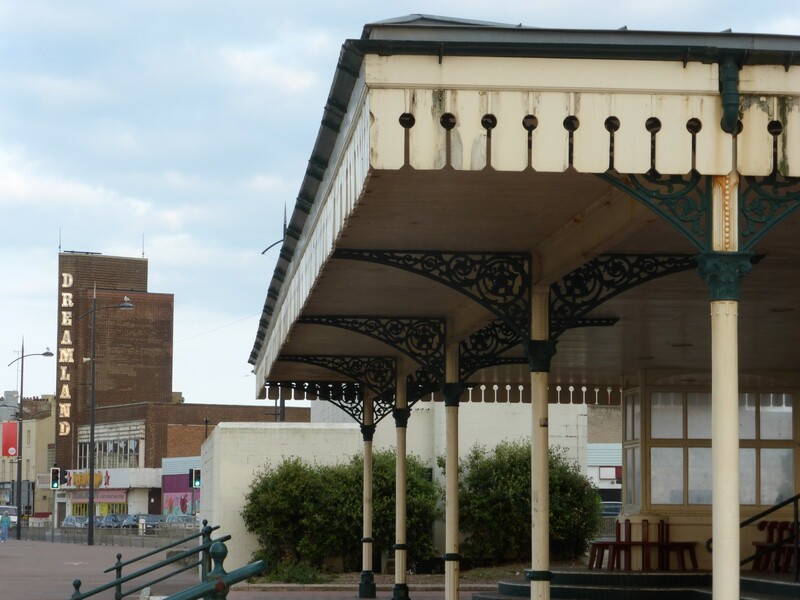 Alone at first, Eliot stayed at a hotel on one side of the old town (Cliftonville) and took a daily tram to the other where he would sit in a Victorian shelter and write. This regimen was to midwife part three of The Waste Land, subtitled The Fire Sermon. The shelter still stands. Indeed it has recently been awarded Grade II listed status although it bears no notice of this. Rather it remains a stoic, practical edifice at the central point of the town, halfway between the station and the beach, next to a bunker of a public convenience (“TOILETS” a single word shouts at both road and sea). Cheap hotels or abandoned amusements stand at a self-consciously dissociated distance either side along the promenade. The broken fingernails of dirty hands. wrote Eliot in the poem, neatly surmising the Margate of nearly a century later, with the strong brine air the pungent equivalent of the conversations held by happy street drinkers on promenade and street alike. The anonymity of this proud but unrevered shelter is another ‘nothing’ for passing locals or tourists. I have written only some fifty lines, and have read nothing, literally – I sketch the people, after a fashion, and practice scales on the mandoline. Margate seems always to have been a place for cure or entertainment. 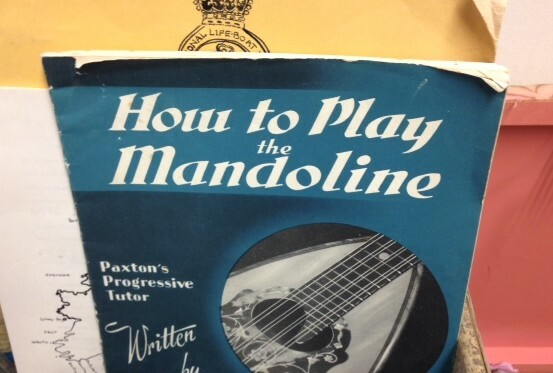 Eliot tried to displace his own concerns with a mandolin(e) that Vivienne gave him (the photo above a serendipitously discovered study volume in one of Margate’s many ‘Vintage’ shops). The dominant pleasure palace of Margate’s contemporary seafront is closed, the bathos of an art-deco structure with a tower that bears its name, ‘Dreamland’. You can see Dreamland in the background of the image of the shelter above. As one of the articles covering the shelter’s listing in 2009 notes, ‘Dreamland currently resembles Eliot’s “heap of broken images”‘. This line from the first part of The Waste Land has itself recently been co-opted as the title for a new exhibition of paintings by Bartholomew Beal, in which the artist has taken lines from the poem to inspire canvases, often featuring figures lost in their own tasks and certainly – suspended in abstracted backgrounds – decontextualised from the immediate world. On the evening of my visit I visited the neighbouring town of Broadstairs. A cosy, rather more gentrified place than Margate, Broadstairs has embraced the legacy of its own literary visitor, Charles Dickens. 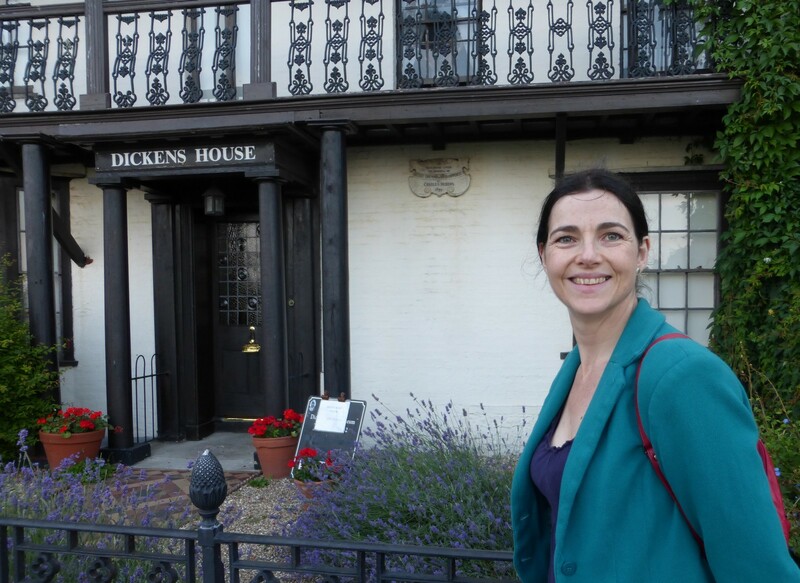 I ate at a restaurant next to Dickens House – itself next to Charles Dickens Hotel (with its bar ‘Copperfields’!) – and looking out across the bay towards Bleak House. I was reminded that the working title for The Waste Land was in fact ‘He Do The Police In Different Voices’, a comment from the admiring Betty Higden in Dickens’ Our Mutual Friend. Betty is drawn as a warm but vulnerable working class woman who is caught in the miserable social cul-de-sac of the workhouse. Another humble person expecting nothing. 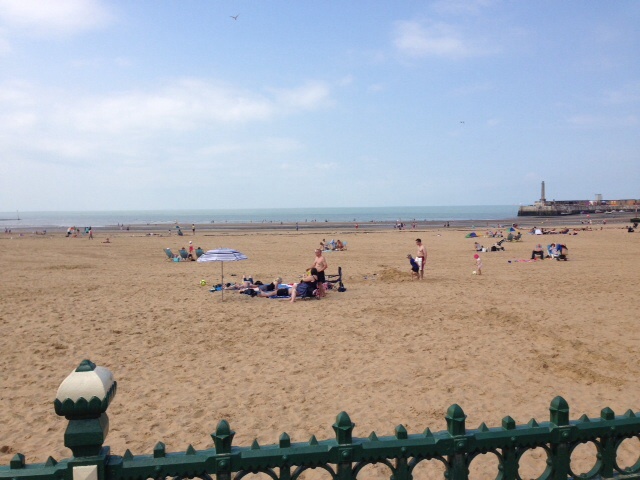 For all that I’m drawing a rather pale impression of Margate, I had a really enjoyable visit. The bay on which the town sits is a vast, beautiful sweep of proper sand on which dogs and families were happily playing. The town’s many historic firsts include the Royal Sea Bathing Hospital (opened 1791, now desirable flats) and first seaside town to get a theatre (Theatre Royal, still in use) and the old part of the town centre contains many attractive Georgian buildings, so there is plenty to see. This entry was posted in Uncategorized by mccaldinarts. Bookmark the permalink.